Since 1986 we have been providing clients accurate appraisals in antiques, collectibles, and fine furnishings. 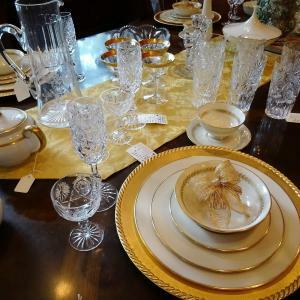 Vintage Harvest is the smart choice for conducting your estate sale and appraisal needs. Vintage Harvest owned by Deborah Straub , has reputation as a business centered on integrity, fairness, quality customer service, and industry knowledge. We put our clients first to provide them what we promise which is why most of our sales are by referral. * 30 yrs. experience appraisal of antiques and personal property. *We are a business registered with the State of Wisconsin since 1986. *At the initial consultation we can provide a portfolio of testimonials from past clients. *Our extensive mailing list proves that our customers appreciate our well organized, clean and fair priced sales. *Our staff of professionals is dedicated to the client and customers to make the sale a success. Specializing in Antiques and Fine Furniture. VINTAGE HARVEST ESTATE SALE STOUGHTON WI. VINTAGE HARVEST ESTATE SALE OF NATURAL CHERRY/MAPLE FINE FURNITURE AND EXCELLENT DECOR. SPECTACULAR SALE OF PRIMITIVES/ADVERTISING/ ANTIQUES BY VINTAGE HARVEST ESTATE SALES. VINTAGE HARVEST PRESENTS AN EXCEPTIONAL SALE OF 19TH CENTURY ENGLISH ART, NEW ENGLAND ANTIQUES , RUGS AND PRIMITIVES. EXCELLENT SALE OF ANTIQUE PRIMITIVES, REPRODUCTION RUSTIC STYLE FURNITURE, DECORATIVE, POTTERY BARN , GARDEN. VINTAGE HARVEST SALE OF FURNITURE FOR ALL ROOMS OF THE HOUSE AND MORE. VINTAGE HARVEST ESTATE SALE FURNITURE, ART POTTERY AND GLASS, ANTIQUES AND BOOKS. LIFETIME COLLECTION OF LANTERNS, BREWERY COLLECTIBLES & MORE CONDUCTED BY VINTAGE HARVEST SALES. Vintage Harvest Estate Sale - A very good sale of collectibles and antiques. CONTEMPORARY FLAIR, ART, ETHNIC ART AND MORE. 1930's Colonial filled With Period Furnishings and Spicuzza painting. EXCEPTIONAL QUALITY ESTATE SALE MADISON WI. 1960'S TO 1980'S FURNITURE/DECORATIVE/TOOLS "Just what I can use" sale. ESTATE SALE OF FINE LENOX PORCELAIN, COUNTRY DECORATIVE, 1930-1970 DECORATIVE & FURNITURE. This company has posted a total of 51 estate sales. Only the most recent 50 sales are shown.